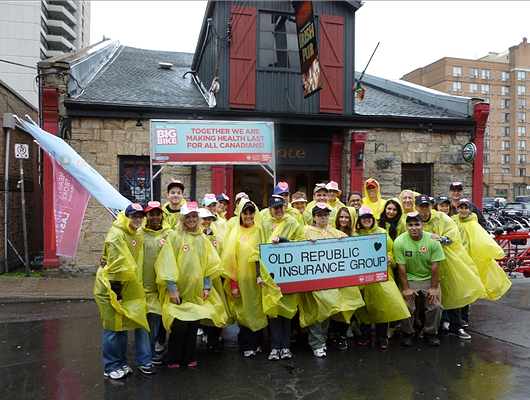 Old Republic Canada prides itself on being one of Canada's long-standing insurance organizations. We started as a small association in Hamilton, Ontario in 1887 and have been progressing since then. We are a Canadian federally licensed insurance company with our head office still in Hamilton, Ontario - proof that we are still in touch with our roots. We are focused on being industry leaders in the underwriting of long haul trucking insurance and in the manufacturing and administering of customized, private-label products for distributors of travel, student accident, and disability insurance. We also provide auto warranty and aircraft hull & liability insurance. Our philosophy is simple – understand each client’s unique challenges and develop the right solution for their risk. Our policyholders know us by how we handle and communicate our claims service. It is this service and professionalism that sets us apart from our competitors. We encompass the entire Canadian operations of Old Republic International Corporation (“ORI” on the new York Stock Exchange) which is one of America’s 50 largest shareholder-owned insurance businesses and currently ranks among the Fortune 500 list of the nation’s biggest companies. For more information about Old Republic International, please visit their website at www.oldrepublic.com. At Old Republic Canada, our greatest resource is our people. We foster a high performance work environment where teamwork, strong leadership, integrity, excellence, service and resourcefulness are rewarded. We are committed to building a corporate culture that offers a positive and professional work environment where employees can have career satisfaction while enjoying work/life balance, and where we can encourage and enable our employees to reach their fullest potential. When you join our team, you join an organization that cares about its employees and their families. We are committed to growing our business profitably. We measure our growth by gross premium written, policies issued, broker, and geographical location. We measure our premium adequacy by the claims ratios achieved on our books of business. We measure our profitability by earning a consistent return on equity. Change is good. We will never forget what made us successful, but we will not be complacent and fail to respond to changing market needs. We are committed to servicing our agency, broker and corporate partners. We will adapt our programs, processes, and systems to achieve efficiencies and make it easy to do business with us. Our policyholders know us by how we handle and communicate our claims service. It is this service and our professionalism that will set us apart from our competitors. We will establish and measure our service to ensure we are continuously fulfilling that commitment. We foster a high performance environment grounded on accountabilities and alignment of behaviours and values with our statutory, regulatory, legal, Old Republic and Board policies and procedures.